Transmits BNC composite video, 12VDC power, and optional audio up to 328 feet using CAT5 cable with RJ45 connectors. 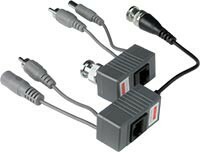 The BNC Composite Video Balun/Extenders transmit BNC Composite Video, optional 12VDC power, and optional audio up to 328 feet using CAT5 cable with RJ45 connectors. Passively transmits real-time monochrome or color composite video, 12VDC power, and optional single channel audio over a single CAT5 unshielded twisted pair (UTP) cable. 75 ohm male BNC Video, male RCA on attached cable, male 2.1 mm (0.083 in) DC power on attached cable, female RJ45 connector. 75 ohm male BNC Video on attached cable, male RCA on attached cable, female 2.1 mm (0.083 in) DC power on attached cable, female RJ45 connector. Dimensions WxDxH: 0.9x1.7x1.5 in (23x43x38 mm). Passively transmits real-time monochrome or color composite video, 12VDC power, over a single CAT5 unshielded twisted pair (UTP) cable. 75 ohm male BNC Video, male 2.1 mm (0.083 in) DC power on attached cable, female RJ45 connector. 75 ohm male BNC Video on attached cable, female 2.1 mm (0.083 in) DC power on attached cable, female RJ45 connector.